This post brought to you by The Marzetti® Brand. The content and opinions expressed below are that of Katie’s Cucina. I’m so excited to share with you my latest spiralized veggie noodle recipe. 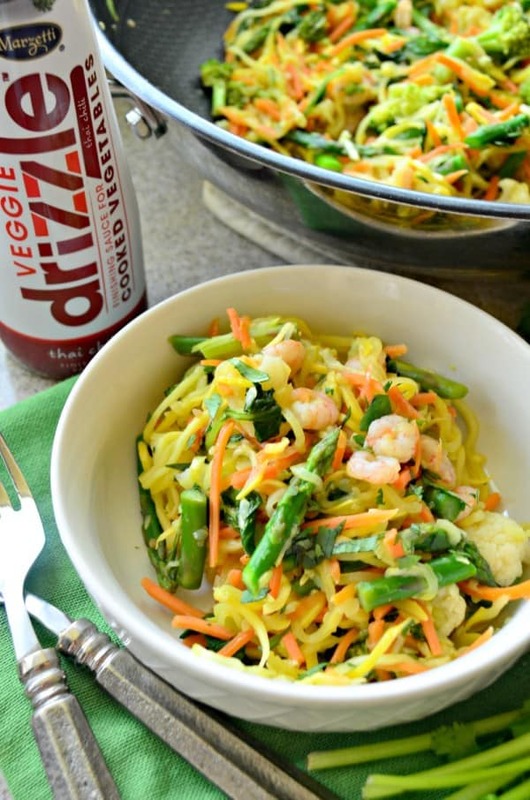 Since receiving the new Marzetti® Veggie Drizzle™ Finishing Sauces I’ve been experimenting at lunch time and I’ve now whipped this Thai Chili Shrimp Zoodles a handful of times over the past two weeks. And I’ll be the first to admit that some days after an intense morning at boot camp I might eat the whole wok full of veggies and shrimp. Let’s talk a little bit about the new Marzetti® Veggie Drizzle™ Finishing Sauce. These sauces were best as the last step to complete your cooked vegetables. Can you imagine just steaming your veggies and then drizzling with one of the four flavors; Thai Chili, Garlic Parmesan, Lemon Basil, or even Honey Balsamic. This product is especially made for cooked vegetables! That’s why it works so well for my zoodle recipe. The vegetables and shrimp steam in the wok and then I finish them off with the Marzetti® Veggie Drizzle™ Thai Chili. 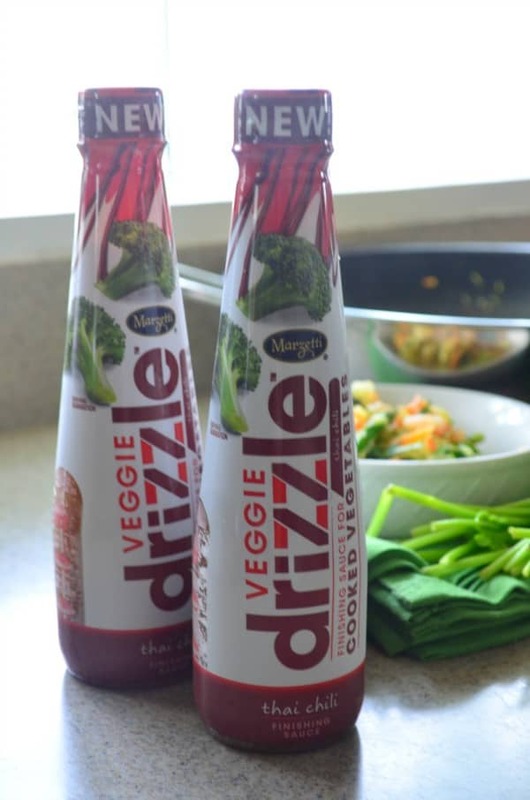 All Marzetti® Veggie Drizzle™ products range between 20-45 calories and can be found in the produce section of the grocery store near the refrigerated pre-cut / pre-prepared items. You’ll never find this product near the salad dressings since it has to be refrigerated. 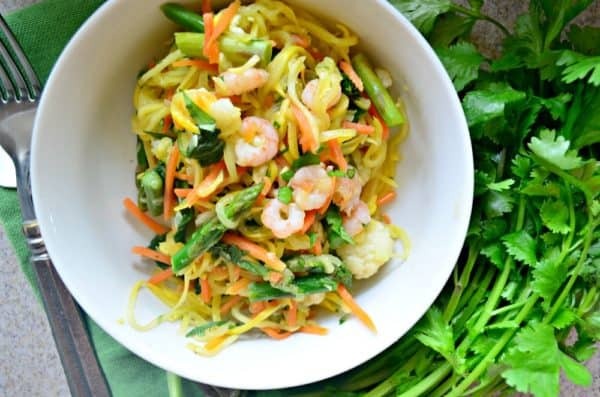 Seriously loving easy zoodle recipes that are full of flavor and my recipe for Thai Chili Shrimp Zoodles makes for the perfect lunch or even dinner! 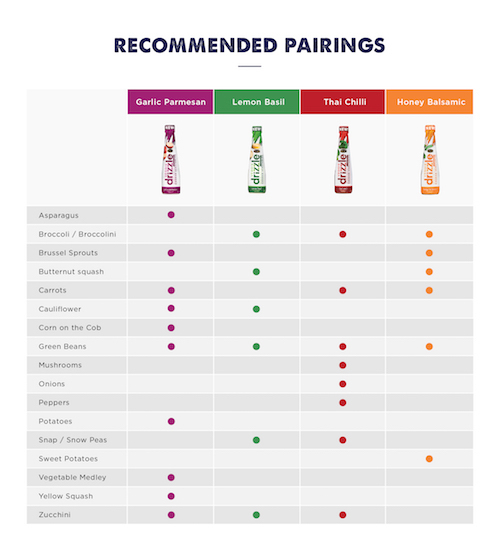 Here is a chart for you to pair your next meal with the correct finishing sauce! In a large wok, preheat it on high heat and add both oils to the wok. Then add in the broccoli, cauliflower, shredded carrots, and asparagus spears. Cook for 3 minutes. Then add in the kale leaves and frozen shrimp. Mix well then add in the yellow squash noodles. Mix well and cook for an additional 3 minutes, mixing periodically. Pour in the Thai Chili Veggie Drizzle, mix well and sprinkle the fresh cilantro leaves on top. Divide among two bowls and enjoy. This sounds amazing and I love how quick and simple it is! That veggie drizzle sauce is going on my shopping list! 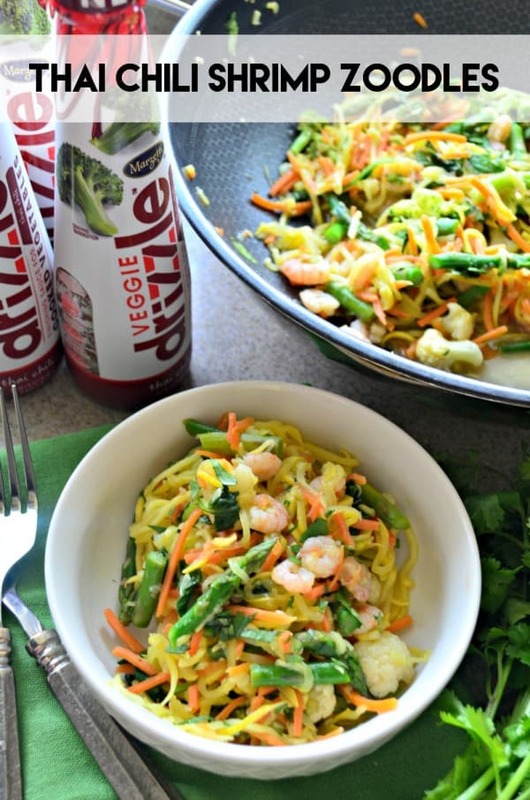 Veggie drizzle is amazing and I love all the flavors! Totally transforms steamed veggies and makes me feel like I created a fancy side dish and just in seconds! Looks like a super easy recipe and a way to help us eat more vegetables.